Micha Magid graduated from the Stern School of Business at NYU with a dual major in Finance and International Business. He started his career in the Mergers & Acquisitions department of JPMorgan Chase. He later moved into the investment management business in 2003. He has since managed money for various large hedge funds focusing on value oriented strategies. In 2006, Micha served as the anchor investor in New York City based Bulldog Gin and is also currently a member of the board and serves on the company’s governance. Christos Gourmos attended Fairleigh Dickinson University to pursue a degree in Hotel and Restaurant Management. Being a second-generation restaurateur, he worked, since the early age of 15, in the family restaurant and went on to acquiring his first business, The Venetian, in 2001. The Venetian is a successful and catering facility generating yearly revenue of $20 million. In 2009, Christos ventured into a partnership at Thavma, a Mediterranean restaurant in Livingston, NJ. (CG) I was born into a restaurant family and continued to learn and better myself in the culinary field as it was my passion. Tell us about Mighty Quinns BBQ. What inspired the idea and what is your vision for the restaurant? (MM) Barbeque is such a universally loved category but so poorly represented in large cities like New York. We see a huge opportunity to change that. What strategic partnerships/marketing strategies have you implemented that have attributed to Mighty Quinns BBQ's success? (MM) The food truly speaks for itself. Our success was born from the pairing of our BBQ with comfortable, unpretentious restaurants. The formula is simple but it's authentic which is why we've been able to grow in the past few years. (MM) Serving all natural ingredients is an absolute requirement in today's market. People want to know what they're eating and where it came from. Our meats are all natural (meaning no hormones or antibiotics) and we source locally whenever possible. Recognizing the convenience of service in a fast casual format is also something that's becoming more obvious to more people. (CG) Always strive to do better. (CG) We don't have a company motto but our purpose is to serve fresh, all natural food at a reasonable price. 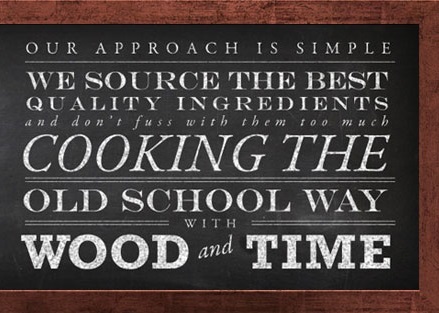 There is no need to complicate the beauty of fast casual service. Your greatest success as Proprietor of Mighty Quinns BBQ? Most difficult moment-how did you overcome and what did you learn? (CG) Seeing our food win awards is an awesome feeling. It validates what we work hard at and our customers recognize the quality and passion that we put into our food. The most difficult moment was making the step to allow our staff to take control of day-to-day operations so we can focus on growing our brand. We learned to trust and that has put us on a much faster growth pace. (CG) Work hard and love what you do. The rest happens on its own. Describe the ideal experience at Mighty Quinns BBQ. (CG) Walk into any of our restaurants without any BBQ knowledge and walk out knowing what slow smoked is all about! Priceless. (MM) Our brisket is what put us on the map and is still our most popular dish. Our smoked wings are also the best I have ever had, anywhere, anyplace, real or dreamt. (CG) Meeting with the team frequently to correct problems and always help when needed. We always want our staff to grow with us so we only promote from within and always create opportunities to move up if they work hard and show initiative. (MM) My father has one of the best business minds of anyone I've ever met or read about. He's the one I wake up every morning to try and impress. He was also responsible for sparking the idea for the three of us (myself, Chris and Hugh) to take Mighty Quinn's BBQ to the next level. (MM) The three of us are currently 100% focused on the Mighty Quinn's brand. (MM) Any place with a quiet beach and good food will do. Simple and perfect. What's next for Mighty Quinns BBQ? (MM) We'll continue to expand in the US but we're also opening Mighty Quinn's BBQ in Asia this year (stay tuned for the announcement). Micha brings a meticulous financial focused approach to both his public and private investments. He currently lives in Manhattan with his wife and two children.